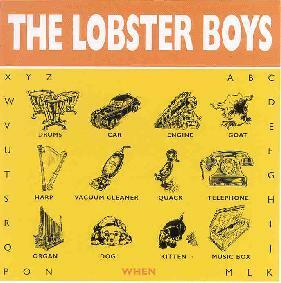 When - The Lobster Boys"
Apparently the eighth release under the name When by Norwegian Lars Pedersen. The bulk of these recordings are an intriguing combination of generally chaotic loops & samples combined with a touch of 60's-style psychedelic pop, including harmonies as reminiscent of the 70s (Queen, Eagles, Sweet) as the 60's (Beach Boys, Beatles, Move), and middle eastern influences indicated by the photos (Morocco? Turkey?) in the booklet. Most of the tracks are built from an array of "found" sources alluded to on the back cover (showing old LP sleeves of Children's records, jazz, show tunes, classical guitar, sound effects); these are almost invariably sonically interesting, and any musician interested in creating backing tracks of that nature would be well-served by giving it a listen. Pedersen certainly keeps things interesting by continually throwing in new styles, such as the jazzy trumpet riff (Louis Armstrong and Duke Ellington albums are depicted on the back of the jewel case, but the sound is almost more Herb Alpert) of "Cut" and the middle-eastern sounding violin over acid jazz groove, with occasional carival or blues organ spicing on "The Greatest Sorrow On Earth". Sometimes the pure 60s pop such as "Flower Jam" and "Too Much Hello Goodbye Again" gets a bit cloying and too obviously Beatles/Beach Boys derived (without quite the depth of production that full bands like Olivia Tremor Control & their ilk have exercised), but other moments like "Sunshine Superhead" are infectiously catchy. The outstanding moment on this CD is the final, untitled, (and lengthy at over 16 minutes) track, which begins inauspiciously enough with undirected jaw harp and chiming rhythm over a background chant, but after the chants drop out, a quickening pulse presages the introduction of tortured guitar over intensifying percussion and pulsating drones (including glissando guitar), finally dissolving in heavily-processed feedback noise and drawing the album to a very nicely Faustian conclusion. Except for the final mystery track, where the excess of too many of the other tracks actually fits, the plethora of influences and sources here, while ambitious and well-executed, don't quite fit together as a unified whole, at least to these ears (which set a pretty tough standard to meet when it comes to loop-based recordings such as this one). But perhaps they will to yours. For more information you can visit the When web site at: http://www.infernalhorde.com/when/. Visit the Jester Records web site at: http://www.jester-records.com. Distributed by Voice Of Wonder; PB 2010 Grünerlokka; N-0505; Oslo; Norway.